Set in an expansive and beautiful world, Grand Fantasia offers players a variety of engaging features new to the MMORPG genre. Players take on the role of Sprite Messengers, powerful beings with the ability to interact with sprites, mystical creatures of the ancient world. Chief among the game’s key features is its innovative pet management and crafting system. Players customize their pets, called “sprites,” during character creation, and can own up to three at a single time. Sprites aren’t simply pets that follow after their owners; rather, they have a variety of dynamic mood, relationship, and skill scores that are all affected by the actions of their owners. Players can chat with their sprites as they progress through the world; outfit them with items and clothing; and use them to gather resources, craft items, and salvage objects for parts. The game allows players to choose from four starting classes at level five: Fighter, Hunter, Acolyte, and Spellcaster. These novice classes eventually branch out into a total of eight master classes: Berserker, Paladin, Assassin, Ranger, Cleric, Sage, Necromancer, and Wizard. There is a countless variety of class-specific and guild-based skills, items, and sprite-gear available for players to specialize and distinguish themselves from others who choose similar paths. Hundreds of different quests are available to players as they progress through the game, each offering valuable rewards. Many of these quests also grant reputation points for the various factions located throughout the world of Saphael. As players improve their standing with certain factions, they unlock additional quests, items, rewards, and titles. For players seeking an action-oriented experience, the game offers PvP combat, team-based battlefields, massive dungeons, and epic bosses. Battlefield participants join a team of fifteen players and compete for capture and control of key points scattered throughout a map. Those who perform well acquire a unique PvP currency that can be used to purchase special items. Opportunities for exhilarating group play also abound with numerous group quests, dungeons, and legendary monsters located throughout the world. Players can obtain titles, achievements, and for accomplishing rarer feats, even earn a colossal in-game statue of their character, prominently displayed outside the gates of a capital city. 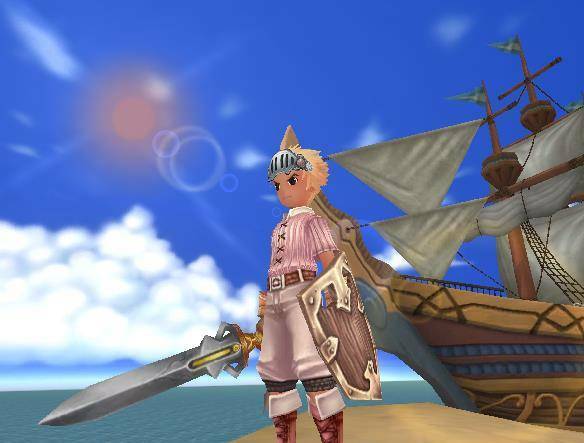 Grand Fantasia features a robust guild system that allows players to form associations, set custom ranks, embark on guild quests, accrue guild experience, fame, and attain special guild skills. The detailed guild interface even includes an in-game message board to make communication between players that much more convenient. Additional features of note include a player-based economy and extensive upgrade system. Players can sell their items by visiting auctioneer NPCs located in all the game’s major cities. The fortification and alchemy upgrade system allows players to augment and customize their weapons, improving damage bonuses and adding various glow effects.